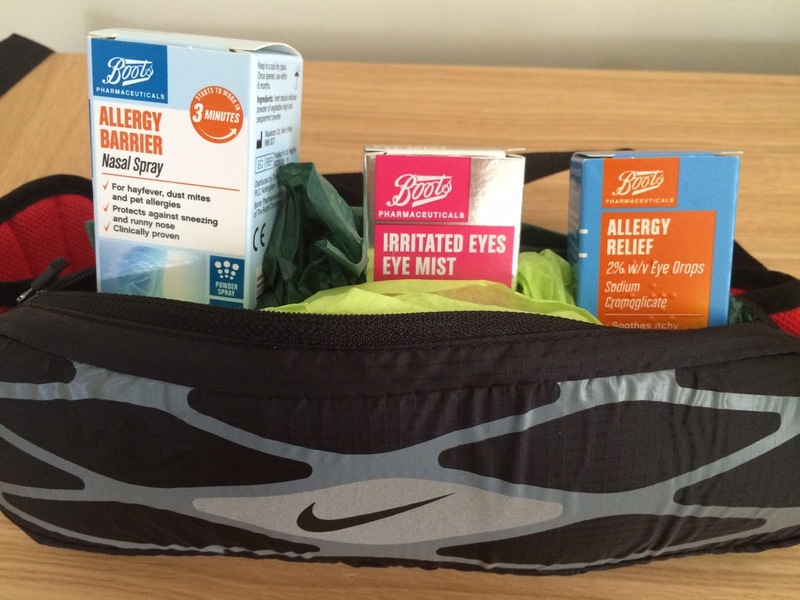 When Boots got in touch with me about trying out a few of their products to help with the symptoms of hay fever, it couldn’t have been better timing! I’d had sniffles for a few weeks and suspected it was hay fever but just never got around to doing something about it. My “hay fever survival kit” arrived and sat on my dining table for a few days – till the Run Hackney 5km run on The Marshes where I suffered at the hands of pollen. So for the Run Hackney Half Marathon the next morning, I was prepared! The kit also included a handy water bottle for running, a waist pack and sunglasses. I opted for the Irritated Eyes Mist as you use it externally and works with contact lenses. I also tried the Nasal Spray – it actually is a peppermint flavoured (smelling?!) powder that creates a barrier to stop allergies. The nasal spray and eye mist helped me to shift my focus away from what the weather / allergens were doing to my body allowing me to focus solely on the race, and the experience of the morning! 2) Nasal sprays should be used throughout the season for them to work effectively, not just when your nose starts twitching! 4) Remember that your sunglasses can help too so include them in your prevention plans – they act as physical guard against pollen exposure around the sensitive eye area and are an easy way to stay protected! My mum suffers from hay fever symptoms far worse than I do and has been a regular user of the eyedrops pictured above before I was even sent this kit. She also dons her sunglasses when she ventures outdoors to help keep allergens away from her eyes. I also keep a packet of tissues in my bag at all times too! Great for drying your eyes or blowing your nose when you’re out and about! I’m determined not to let hay fever get the better of me or stop me from training outdoors while the weather is good! Have you got any hay fever survival tips of your own?! p.s Thanks to Boots for providing me with the products to test – rest assured all opinions are my own! The Boots Allergy nasal spray (from the pharmacy counter) in the orange box is brilliant! It's the one thing that stops me wanting to scratch my face off!